You have a remarkably impressive resume. Can you tell me a bit about how you became an expert in relationship marketing? After college, I worked in corporate America in the financial services industry. In 1999 I was scooped up by financial gurus Steve Moller, who wrote the book “Effortless Marketing for Financial Advisors,” and then a few years later by Peter Montoya, who wrote “A Brand Called You.” I worked with both of them, coaching top advisors in the U.S. and in Canada. Then in 2008, two things happened: the very famous market crash — many of my clients were in crisis mode, rather than marketing mode (despite my advising them to go into marketing mode). At the same time, social media was on the rise. In 2007, I noticed there were people doing marketing with LinkedIn, and a lightbulb went off. I hired my good friend Mari Smith, the Facebook marketing guru, to help with marketing, just as she was just getting into Facebook. That’s when I got serious about social media as a profound marketing tool for entrepreneurs and small businesses. You have a profound presence across digital. As marketers, there are so many outlets where you can focus your attention, and it’s hard to choose which one to focus on. How did you create such a comprehensive digital presence? You must have struck while the iron was hot. I recognized the potential of social media and ran with it. In 2008, I began teaching social media marketing for small business owners. I built my personal platforms while testing various strategies. In 2014, I came out with my first full-length social media book, Social Media Myths Busted; we went to bestseller on Kindle the day we launched it. We also started Social Buzz Club in 2011 and now have a network of thousands of influencers cross-sharing each others’ blog content. I downloaded your Savvy Social Media Marketing Blueprint, which is such a comprehensive resource that it made me wonder: How do you decide how much info to give away (for an email address) that doesn’t negate the need for your services? I follow Frank Kern’s advice, “Give your best stuff away free.” That may sound counterintuitive — why give it away if you want people to pay? However, if you take that blueprint and try to implement it, you will find it doesn’t give you everything you need. I created the blueprint to show you what you need, but the “how to” would be an encyclopedia of information to produce and share for free. So the blueprint includes an overview of steps. For someone who is serious about implementing and not trained in the “how to,” then they know they can call upon me to be the trusted resource (because I have the plan) to help them accomplish their social media goals. In the book “Social Media Myths,” I also give a TON of strategies, so that’s more in-depth and you pay a little bit for it. All that being said, I don’t think about it that way. That is scarcity thought! Instead, I think about what I want to sell. I want to sell a course, or consulting, or I want to get paid for speaking. And, I have to prove myself worthy of that. This is a value-based marketing type of environment we are in now, and you can’t just say, “Hey buy my stuff, it’s great!” I have to show you. And since I love imparting useful information, the strategy of giving tips, training and resources really works to build a relationship with potential clients. Another thing that is clear from your marketing material is that you have the knowledge to focus on a giant audience with varying levels of knowledge about social media, but most of your material is focused on those new to the scene. Why such a niche audience? Can a brand ever change or expand its audience? Whenever you set your goals for the year or your marketing plan, you want to revisit the market you’re attracting and then design your strategy and communications toward that. For example, my target market has been business owners, and I tend to specifically attract women business owners. Choose your target audience to focus on and market to them. It doesn’t mean that you can’t take people who are outside of that market on as clients, but you want to focus your marketing efforts and dollars into the niche that you’re the most passionate about. I read your article on tribe building from 2014. Do you have a favorite social outlet for building those relationships? My new favorite is Google Hangouts on Air (HOA) through YouTube and Google +. What I love is interviewing people on Google Hangouts; it build relationships like crazy. We do it through Social Buzz Club, and we host webinars using HOA every week. I also love Facebook messaging and LinkedIn messaging to connect with people. One of my favorite ways to build relationships on Twitter is to retweet. I feel a retweet is the highest compliment you can give someone. It says, “This is quality information and I want my whole audience to see it. I endorse you.” That’s why we created Social Buzz Club, LLC. This platform enables you to share others’ blog content systemically, and includes a built in reciprocity structure through gamification and accumulating points. What are your opinions on influencer marketing? Tell us about Social Buzz Club, LLC. Word-of-mouth marketing is the number one form of marketing. It always has been and always will be. 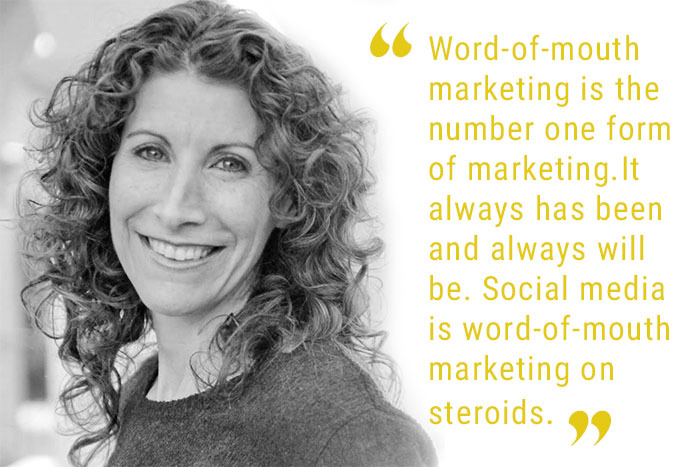 Social media is word-of-mouth marketing on steroids. What defines an influencer may change over time and how they gain visibility may change. What we are seeing now is people who are influencers are people who never had a shot before. Before it was celebrities and the shock jocks and the people who were larger than life; it wasn’t realistic for the average person to be an influencer. But social media leveled the playing field. If you want to be an influencer, you can with social media. You can do it the old-fashioned, shock jock way, or if you have something you’re knowledgeable about and you’re willing to communicate it and work towards it, you can become known as an expert or go-to authority in that field. Was there a favorite campaign that you’ve worked on over the years? What made it stand out? There have been a variety of campaigns from celebrities, startups and book launches that have been great fun. For example, when I launched Social Media Myths BUSTED: The Small Business Guide To Online Revenue, I involved about 30 successful business owners and influencers on social media. Incorporating Google Hangouts on Air (HOA) to interview them, I was able to get content for the book, quotes for images, vlogs for the book website. On launch day we did a three-hour HOA along with social media and an email campaign. It was fun to pull the book together, create the marketing plan and content and engage the team of contributors and other influencers to make it go viral and ultimately, to number one bestseller on Amazon in two categories. What is your number one tip for creating buzz around a brand? You have to know your audience, but more so than that, your audience needs to know you. And you need to know them and who they are. Create an avatar; name the avatar and talk about its life: Joe surfer dude who gets up at 6 a.m. to catch waves. He has two kids, he lives in a two-bedroom apartment and he doesn’t care about labels. So if your product is suntan lotion for surfer dudes, you need to find out how your product fits into his life. You know that he has kids, but they’re only meeting their budget month to month. They have 2 kids, one is 2 one is 8. His marriage is on the rocks and he is stressed out because he isn’t surfing enough or working enough. Develop personas and understand who they are and then know where they hang out, online and offline. What do they read, when are they there. Know them on a granular level and then go engage with them there. The number one tip is engagement, but you need to know them so you know how to engage them. Then you may publish coupons in surfing magazines or websites. Write blogs about the surfing lifestyle and family. Interview success stories. Promote your brand as the surf subculture resource. Watch what happens then. Word will get around because you offer value that they can’t find elsewhere. That is one tip, but there are a lot of ideas. If you’re a small business, rising thought leader or passionate entrepreneur and want more ideas, I recommend turning to a consultant who specializes in relationship marketing and has the cost effective solutions to position your brand for profits. Thanks for the tips Laura! Community manager, digital marketing enthusiast, rescue dog lover, oversharing blogger, on a quest to see the world. Advocates, journalists, entrepreneurs. We interview four women who are making waves in politics and the world of content. Their inspo is contagious.